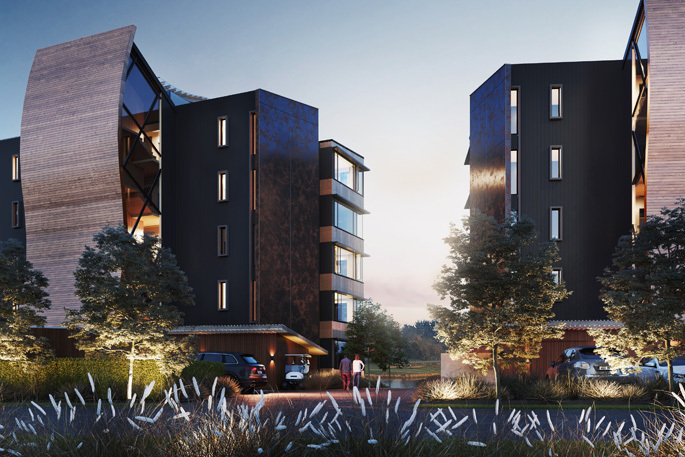 The Clearwater Quays 5-level apartment development at Clearwater Resort Christchurch will be constructed in 2019 to showcase engineered timber. A new programme aiming to boost mid-rise building construction using New Zealand-engineered and panelised framing timber will deliver a range of regional, social, environmental and other benefits too. Red Stag Investments Ltd, a company with its roots in forestry, wood processing and property development, has partnered with the Ministry for Primary Industries to deliver Mid-rise Wood Construction, a four-year, $5 million Primary Growth Partnership programme. Red Stag Investments Ltd is contributing $3 million, while MPI funding $2 million during the four-year PGP. A mid-rise building is four to 12 storeys high. If successful, the programme expects to deliver economic benefits of $155 million by 2023 and $330 million by 2036, driven by a 10 per cent lift by 2023 in the wood construction industry’s market share across the multi-unit residential and non-residential market. Red Stag Group chief executive officer Marty Verry says combining cross-laminated timber – or CLT – glulam and panelised framing timber is a cost-effective, fast, resilient, and sustainable system for mid-rise construction. “Our PGP programme aims to encourage widespread adoption of precision-engineered timber in mid-rise building construction in NZ. “Aside from its natural beauty, engineered timber provides a very strong, low carbon and comparably low-cost alternative to steel and concrete,” says Marty. Marty says the use of prefabrication can speed up construction by as much as 30 per cent and reduce cost to help meet NZ’s acute need for more accommodation. “Globally, there’s been rapid growth in the use of engineered timbers such as cross-laminated timber and glulam for construction. However Marty says NZ is behind other countries such as Australia, Austria, Canada, England, and the US in adopting engineered and panelised timber for construction. “This is due to factors such as limited production capacity and little knowledge of engineered wood use and prefabrication in mid-rise building construction. The programme will assemble a collective of excellence – a pool of NZ professionals experienced in mid-rise wood building design and construction – to help share and grow knowledge and expertise within the broader industry. Red Stag will design and build two mid-rise wooden buildings to showcase engineered timber construction, to act as reference sites and inform case studies. The first will be the Clearwater Quays’ five-level apartment development at Clearwater Resort Christchurch, to be constructed in 2019. Construction costs associated with the programme will be covered by Red Stag. MPI investment provided through the PGP will contribute to other aspects of the programme, such as design, collating and sharing information, and establishing the centre of excellence. MPI’s director of investment programmes Steve Penno says benefits from the Mid-rise Wood Construction PGP programme will be felt beyond the co-investors. “Engineered timber provides the opportunity for NZ to add significant value to NZ-grown timber,” says Steve. “It’s also a natural and sustainable resource. “The PGP programme aims to substantially increase demand for engineered wood products in buildings, which will have associated flow-on benefits across the entire supply chain. The Mid-rise Wood Construction PGP programme was launched in Wellington last month by Agricultural Minister Damien O'Connor, and Forestry and Minister for Regional Economic Development Minister Shane Jones.